Home / BlogEvents / Migraines or canker sores got you down? Forget prescription drugs, we’ve got natural treatments that are just as effective! We wanted to share two organic products that have been best sellers with customers during this past year. 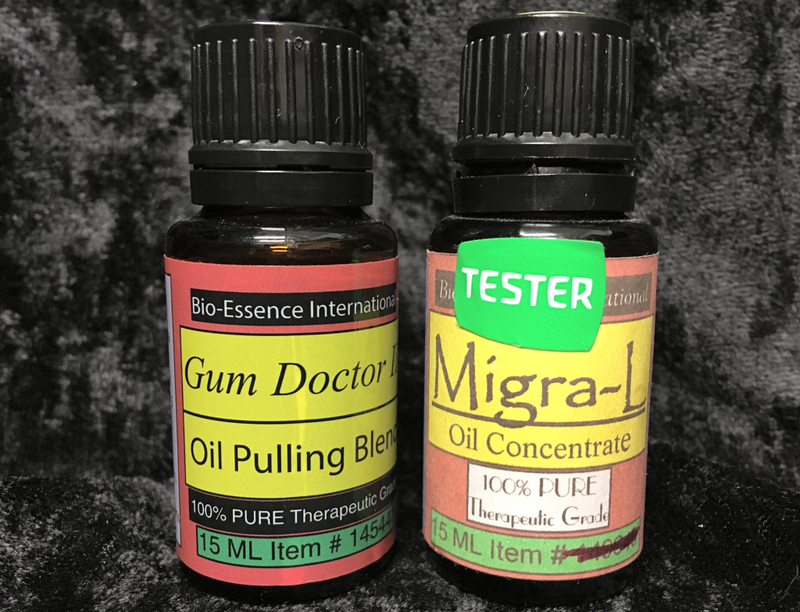 One is specifically designed to reduce migraine headaches, and the other is effective at dissolving mouth germs that cause canker sores & bad breath. Both are Bio-Essence International products – that’s our line of all-natural, organic health & wellness remedies proven effective by a decade's worth of repeat customers. MIGRAINE HEADACHES If you suffer from severe headaches or migraines, allow us to introduce an effective, organic treatment - MIGRA L. Blended from peppermint, spearmint, eucalyptus, marjbran, lavendar, basil, roman chamomile, and helichrysum, this concentrated oil is mixed with water in a diffuser or applied (in small doses) to a tissue, then rubbed directly onto temples and the neck. It quickly relaxes and soothes pain points. Natural ingredients include peppermint, spearmint, eucalyptus, marjoram, lavender, basil, roman chamomile, and helichrysum CANKER SORES & BAD BREATH Gum Doctor Oil Pulling blend (all organic) is based on an ancient Ayurvedic (holistic) dental technique that involves drawing out toxins from the body through the mouth to improve oral health. More specifically, it kills and disinfects canker sores as well as mouth & throat bacteria that create bad breath. Add 10 drops to 1 tablespoon of extra virgin coconut oil or sesame oil, and swish for 5 minutes in your mouth before spitting out. For best results, we’d recommend doing this on as empty a stomach as possible – before bed, or in the morning, for example. Natural ingredients include spearmint, black pepper, cinnamon, clove, eucalyptus, lemon, myrrh, rosemary, and tea tree oil.